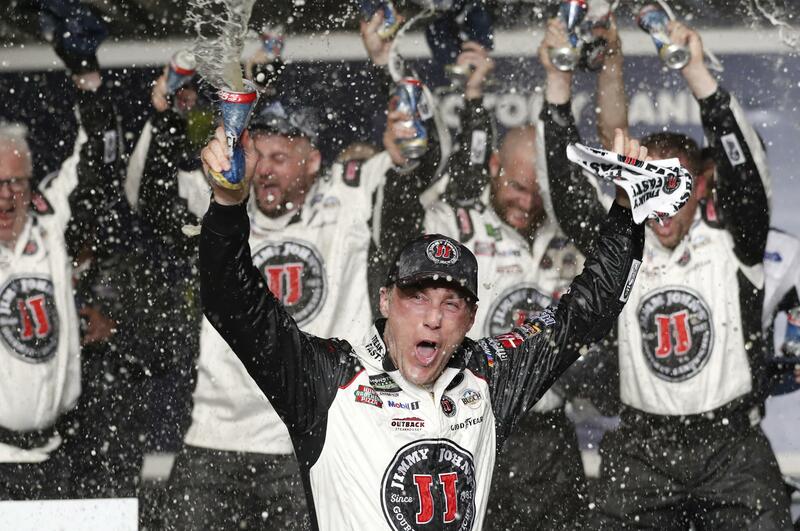 UPDATED: Sun., Feb. 25, 2018, 9:43 p.m.
HAMPTON, Ga. – Kevin Harvick completed his weekend mastery of Atlanta Motor Speedway by holding off Brad Keselowski on Sunday in the rain-delayed NASCAR Monster Energy Cup race. Harvick, who was dominant Saturday in winning the second-tier Xfinity event, started fourth in the Cup race and quickly proved he had the car to beat. The start was delayed two hours, 30 minutes by rain. The threat of more rain added urgency in the late battle for the lead. There were reports of drops of rain with more than 130 laps remaining, leading to increased concerns the race could end early. Clint Bowyer was third, followed by Denny Hamlin. Harvick quickly moved from 19th back to the lead following a green flag pit stop early in the race and again quickly moved back to the lead following a pit stop on lap 252. He took the lead following a competition caution on lap 30 and stayed in front to take the first-stage win. Harvick’s crew had difficulty during his pit stop following the first stage, and he had lost ground when he returned to the pit. Harvick was 19th following the unscheduled pit stop and returned to the lead on lap 131 before Brad Keselowski won the second stage. Harvick’s No. 4 Ford has become a familiar figure in the lead at Atlanta. He led 141 of 163 laps Saturday for his Xfinity win after his strong performance in last year’s Cup race. Despite that recent dominance, this was only Harvick’s second Cup win in Atlanta. He also won in 2001, giving the Richard Childress team a win following the death of Dale Earnhardt in Daytona a few weeks earlier. Harvick was given a new No. 29 in Earnhardt’s car. Following the win, Harvick held three fingers out of the window in tribute to Earnhardt. Harvick duplicated that three-finger salute after Sunday’s win. Published: Feb. 25, 2018, 6:32 p.m. Updated: Feb. 25, 2018, 9:43 p.m.